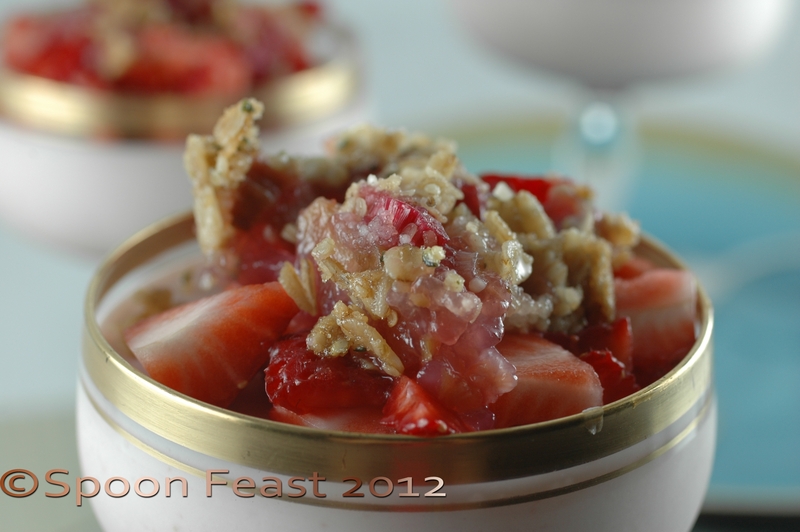 Strawberries enhance the tartness of rhubarb. Classically they go together like hand in glove. But they don’t have to. I like strawberries and I like rhubarb, both separate and together. The local grocery had a sampling table set up promoting hemp seeds for their nutritional value. 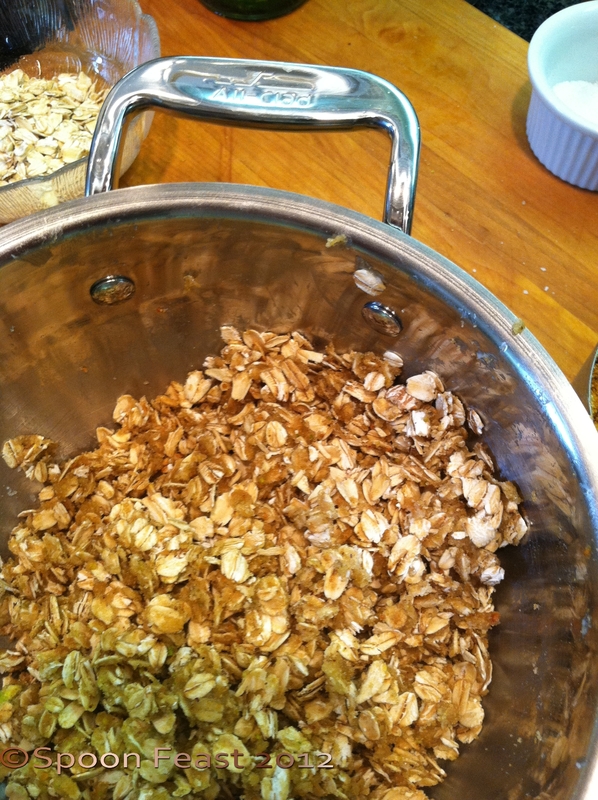 I picked up a bag intending to use them in a multi-grain bread, but used them instead of nuts in the oatmeal crisp. So you are really getting three desserts today; you can eat each separate and then together. Let’s talk briefly about the hemp seeds. These seeds are not the variety of hemp used to “get high” anymore than you can “get high” from pistachios. They are delicious, have great nutritional value and I thought it may push the envelope a bit to use them. You can toast them but the texture is fine so it would be best to use them in something rather than a snack food. 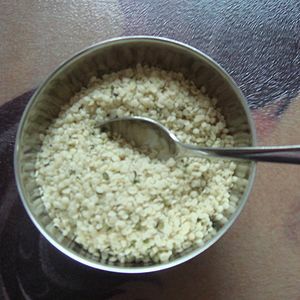 If you desire, substitute finely ground pistachios or almonds instead of hemp seeds. This entire dish consists of three recipes. Each quite simple. The beauty is you can eat the strawberry “cheesecake” without the rhubarb compote and the compote without the cheesecake. The cheesecake in this case is not baked, does not contain as much fat as traditional cheesecake; hence the quotation marks. Make this with cream, or half and half (even the fat-free kind), Greek yogurt, cream cheese (can also be low-fat) and low-fat sour cream if desired. Depending upon your choices of regular, low or non fat versions, you can have a pretty nifty dessert. Puree the strawberries until smooth. Set aside. Warm the cream cheese slightly in a microwave or wrap in a warm towel for 10 minutes to soften. The cream cheese whips better when soft. Place the cream cheese in the mixer along with the sugar. Whip until smooth, add the strawberry puree. If using gelatin leaves, soften the gelatin leaves in cold water for 10 minutes. When soft, squeeze out excess moisture. Add to warm liquid to melt, in this case the warm cream. If using powdered gelatin, measure out the cold cream into a heat proof bowl. (Stainless bowls work great) Sprinkle the powdered gelatin over the surface of the cream. Allow the gelatin to “bloom” for 10-15 minutes. Place the bowl over a pot of boiling water (double boiler) to warm the cream and melt the gelatin. Careful in both cases, gelatin burns and scorches easily. Be careful and pay attention. Heat cream and bloomed gelatin until warm and melted in a double boiler. Add yogurt, be careful not to scorch, stir until warm and gelatin is totally melted. Add the softened gelatin to warm cream and yogurt. Add the gelatin mixture to the whipped cream cheese and strawberries. Pour the mixture into desired containers: pretty stemmed glasses, ramekins, small bowls, fancy tea cups or a large dish. I used stemmed “Marie Antoinette” champagne classes for this. Refrigerate 2-3 hours or overnight for the gelatin to set. 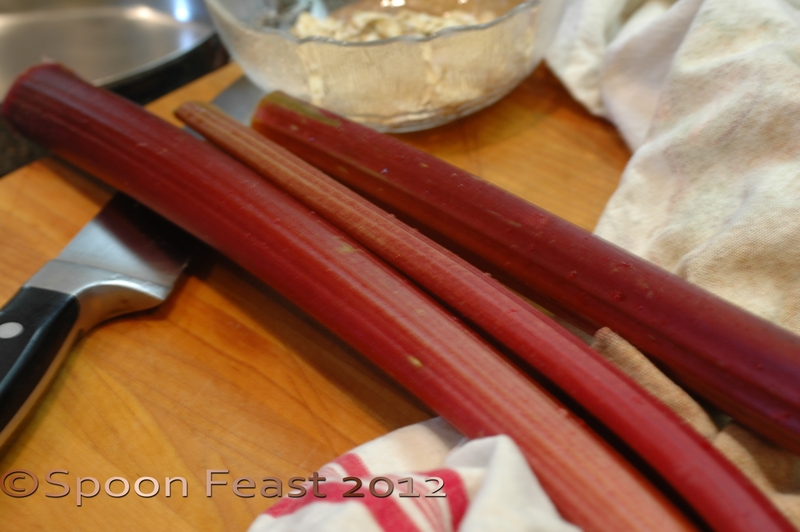 3 stalks of fresh rhubarb, washed and sliced into pieces finger width wide. Be consistent. 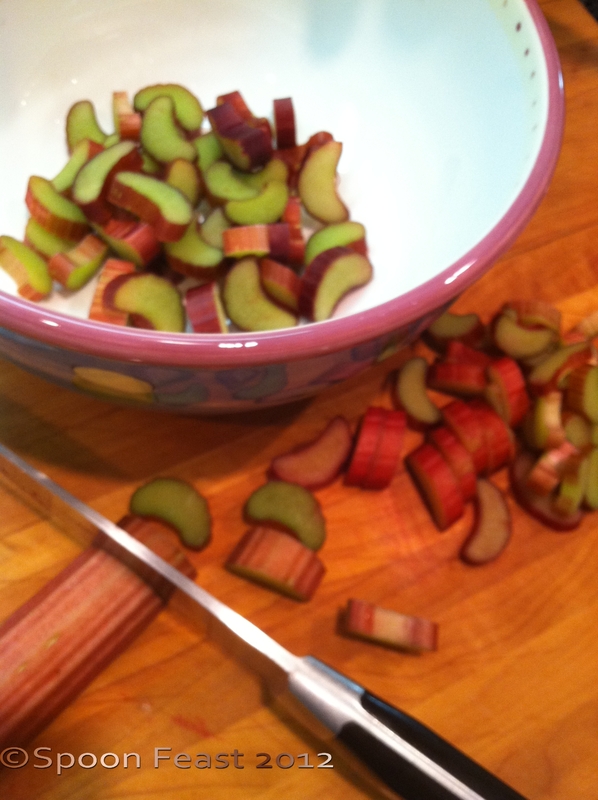 Wash and slice the rhubarb. 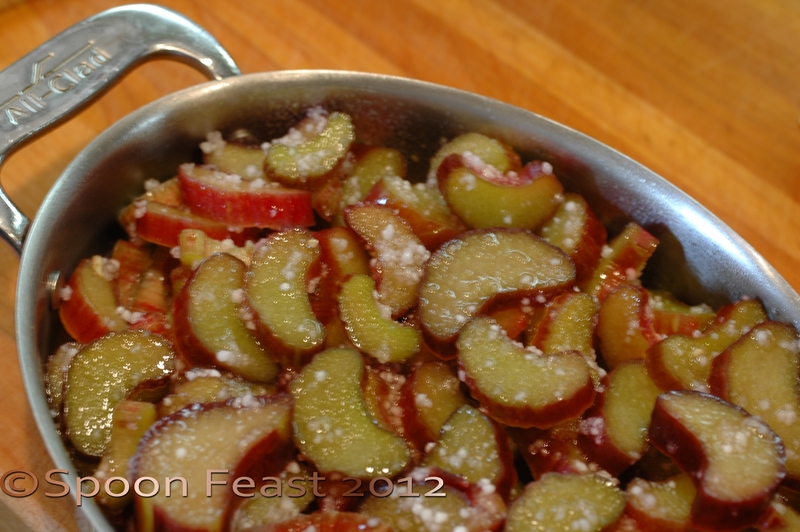 In a large bowl, combine the rhubarb, sugar and tapioca and vanilla. Allow the mixture to rest for 15 – 30 minutes. Meanwhile make the crisp part. 1/4 cup whole butter, soft not melted! 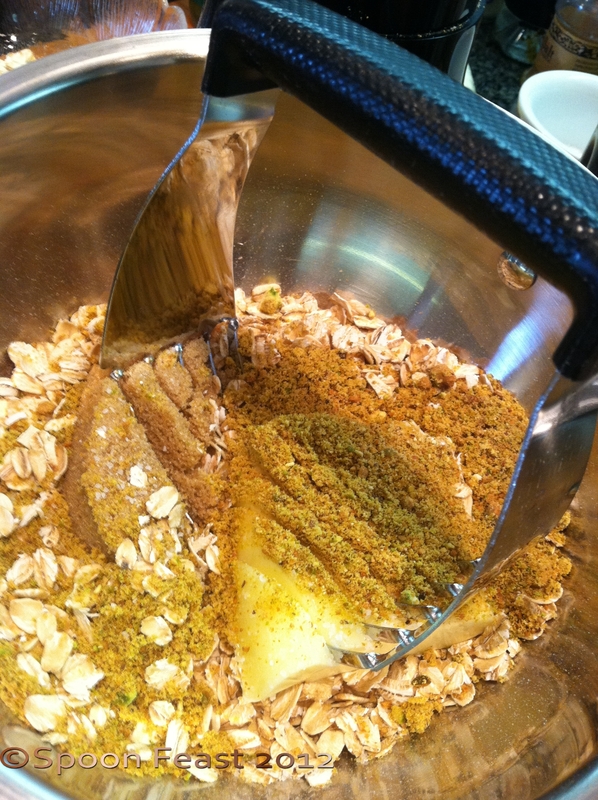 Combine the oats, sugar and seeds and salt, cut in the butter until the mixture is like coarse cornmeal. 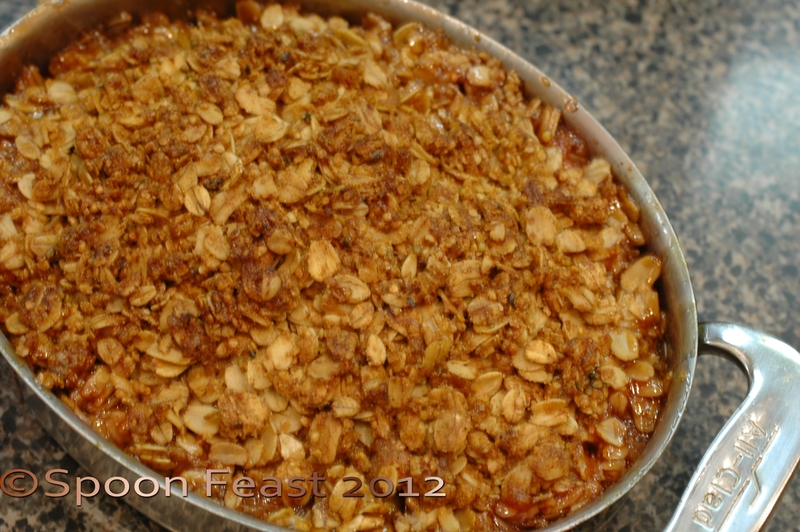 Place the macerated rhubarb mixture into a baking dish, top with the oatmeal hemp seed streusel mixture. Bake for 1 hour in an over set at 350°F or until the mixture bubbles. 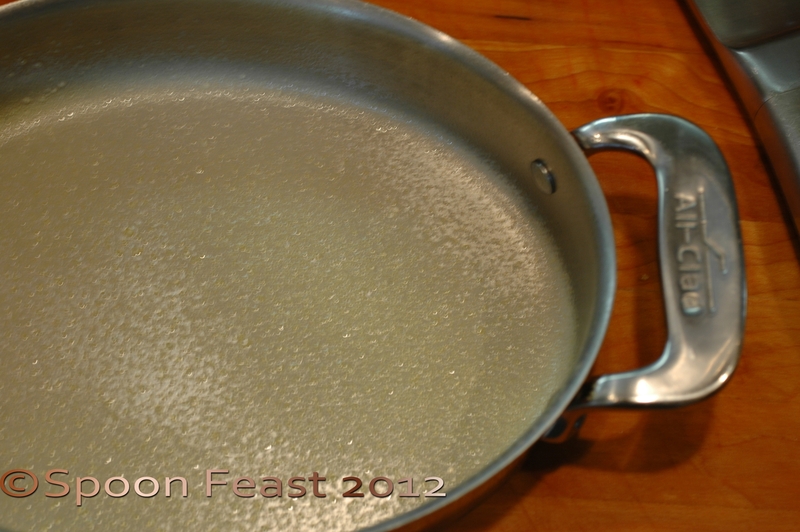 Be sure to place a pan under the dish to catch all of the drippings for easy clean up. 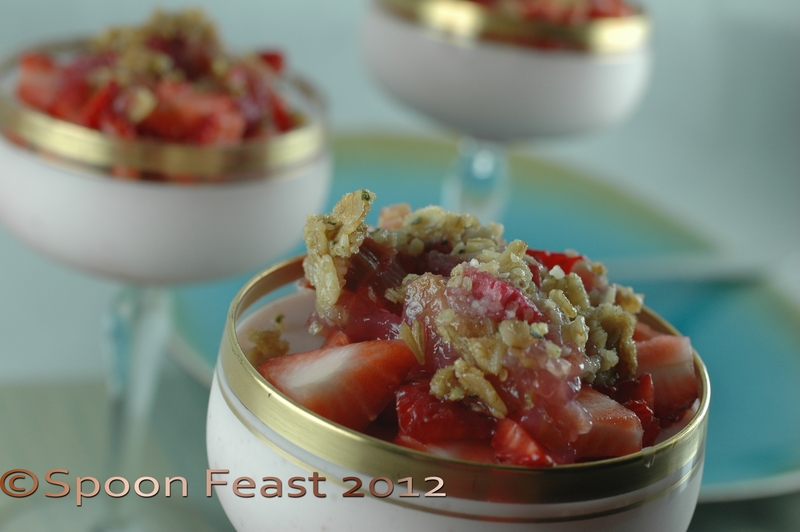 To serve, top each chilled strawberry cream cheese dish with a generous dollop of warm rhubarb compote. Make sure you get some of the crisp part for the top. 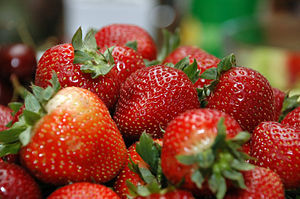 Add sliced or fresh diced strawberries if you like. Garnish with mint leaf and serve with a smile! This entry was posted in Cooking, Recipes and tagged Cheesecake, Compote, cook, cooking, Cream cheese, Dessert, greek yogurt, Hemp, Rhubarb, rhubarb compote, Rhubarb pie, strawberry cheesecake, strawberry rhubarb. Bookmark the permalink. ← The Worlds Best Olive Oil and a Give Away! Thank you! I hope you try some. What a pretty dessert. I will have to use ground almonds instead of the seeds but I’m sure the recipe will be delicious. yes, they will be! Almonds are my favorite. I won’t buy the seeds again, they were pricy. I like other nuts better than the seeds. That is the way I will make it then. am I dreaming??? a healthy cheesecake? 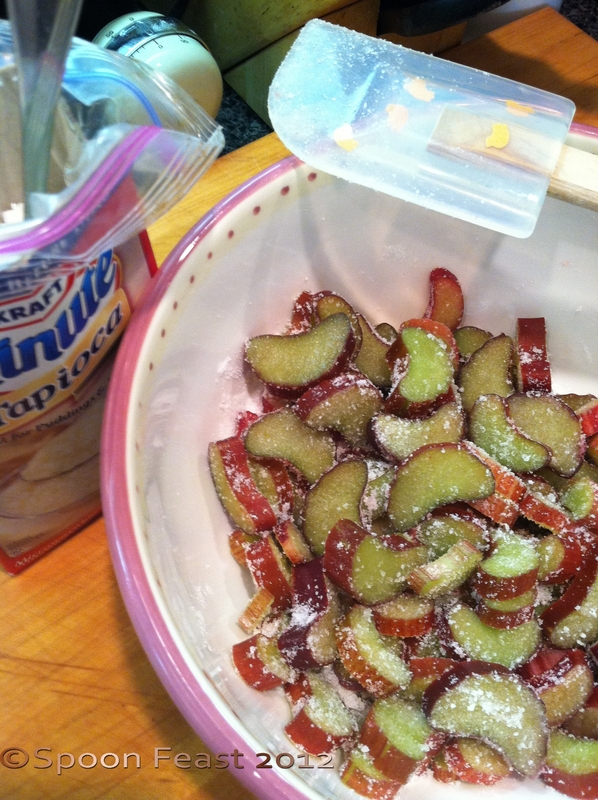 love this idea and totally agree: strawberry and rhubarb is a match made in heaven. the last shot is stunning. Thank you! I hope you try it, it is quite tasty. I bet your little one would like it. Holy Cow! These are fabulous and your photos are beautiful. I’m planning to eat my way through your blog. Yum!